For over one hundred years, experimental towing tanks and wave basins have provided naval architects and marine engineers with a reliable method of predicting the performances of a marine going vessels. These methods are costly and time consuming. Today, numerical modeling in the form of Computational Fluid Dynamics is drastically changing the process of ship design and optimization. For over one hundred years, experimental towing tanks and wave basins have provided naval architects and marine engineers with a reliable method of predicting the performances of a marine going vessels. Towing tanks have been used for resistance and propulsion tests to determine how much power is needed to achieve guaranteed speeds. Performance depends upon the non-linear interactions between the hull, the propulsion system and the hydrodynamic environment. In order to predict vessel performance with high accuracy all of these interactions must be modeled in detail, resulting in an expensive and time consuming experimental model building and testing program. These costs result in experimental testing being deployed relatively late in the design cycle for verifying an established design rather than for truly optimizing a design from the ground up. Such early stage optimization is growing increasing important given the current demand for energy efficient vessels. Computational Fluid Dynamics (or CFD) is now a well established alternative to experimental testing, providing a “virtual” model that can be deployed much earlier in the design process at lower costs. Naval architects and marine engineers can then employ a multitude of "what-if" scenarios and utilize the resulting engineering data to improve designs. Furthermore, CFD has the distinct advantage of result accuracy independent of scale. In certain parts of the industry, such as in the design of the high-performance vessels that compete in the America’s Cup, numerical towing tanks have completely displaced experimental towing tanks. Modern CFD methods account for 6-Degree-Of-Freedom vessel motion in an automatic manner. 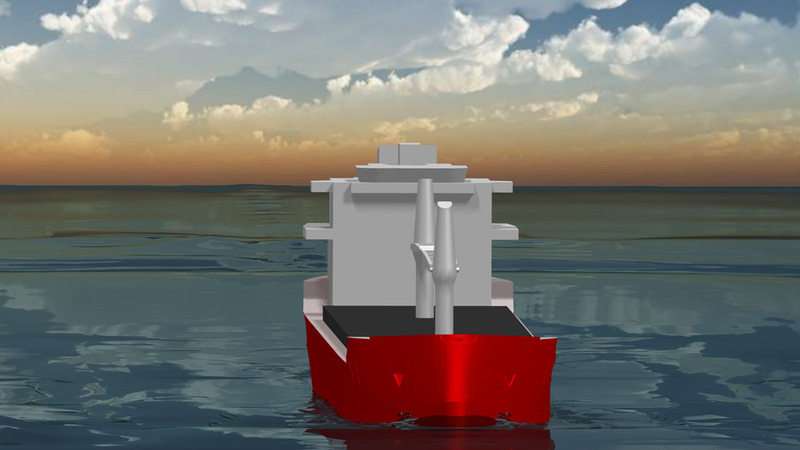 Dynamic Fluid-Body Interaction models integrate the forces acting on the vessel at every simulated time step, and adjusts the vessel position and orientation accordingly. Outputs such as time dependent ship dynamics and hull performance are default outputs, as are graphical representations in the form of still photos and videos. Used effectively, numerical towing tanks reduce the amount and cost of physical towing tank tests by providing a more refined and optimized design that requires fewer modifications in order to meet contractual obligations. Experimental wave tanks have served many commercial purposes over the years. Most frequently they are used to analyze seakeeping performance, wave impact loadings and wave added hull resistance. Wave tank testing has grown in recent years with increased interest in deep water production of fossil and renewable energies. As with the discussion of numerical towing tanks, the Numerical Wave Tank (NWT) can now be deployed to accomplish many of the same objectives. Only very recent advances in CFD techniques, such as the development of the overset grid methodology, have made such simulations feasible for the first time. Seakeeping performance encompasses the vessel motion in wind, waves and current. Standard seakeeping tests are usually performed with free-running models in irregular seas at constant propeller revolutions, with speed (i.e. propeller revolutions), sea states, and encounter angles varied in test series. Motions and accelerations, as well the occurrence of slamming, propeller emergence, and shipping of green water are recorded. Turret or spread mooring of offshore structures such as FPSO, FSO, or semi-submersible can be modeled as well as coupled dynamic motion of side-by-side or tandem connected offshore structures. Large heave and pitch motions in heavy seas can cause the ship hull surface to impact with the water surface with a sufficiently high relative velocity to result in very high local pressures. The resulting slamming forces acting on the structure can cause vibrations and even damage. Measurement of the local forces or pressures helps in determining the critical loads. For tests of offshore structures, complex environments consisting of wind-seas, swell, wind, and current can be simulated simultaneously. A ship is usually designed with a focus on its performance in calm water. However, operational conditions should be taken into account, including added resistance due to waves because it is an important factor in the economical performance of a ship. Self-propulsion tests in head waves can also be performed against regular waves or irregular long crested seas. Mean thrust, torque, and propeller revolutions, as well as the ship motions and accelerations, are typical outputs. In general, these tests result in a speed-power prediction including the influence of wind forces for the full scale vessel. Clean, renewable energy is one of world’s top priorities. Not only can renewables reduce our dependence on carbon-based energy resources, they also help to insure our energy security and strengthen local economies. Offshore wind and wave energies, in particular, are highly desirable resources. Offshore wind and wave energy farms offer one of the best, new opportunities for clean, abundant, environmentally benign, and reliable utility-scale energy generation. Designing devices capable of withstanding the harsh conditions of offshore deployment while economically producing renewable electricity is an immense challenge for developers. The extremely non-linear interactions of wind and wave energy devices with the forces created by ocean waves, as well as the diverse conditions experienced, drive the need for advanced numerical modeling techniques beyond that of the linear analyses used frequently in marine design. CFD, coupled with other computational engineering techniques such as control system modeling and Computational Structural Mechanics can provide the analysis needed to evaluate early stage conceptual designs in less time and cost than physical wave tank testing.